Posted on January 16, 2015 at 10:53. POODLE is a vulnerability that effectively lets a third party become a “man in the middle” on SSLv3-encrypted network connections. This is very bad from a security point of view. If you have not done so already, go to Wikipedia’s POODLE page and read more information about it. 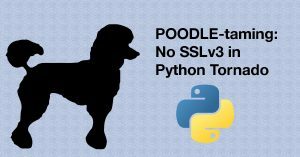 This post shows how to deal with the POODLE vulnerability for Python Tornado by turning off SSLv3. Posted on December 9, 2014 at 09:42. Elastisys is looking to expand its team to include a driven business developer and entrepreneur. The job posting is in Swedish, as good Swedish skills are a must for this position. Download the PDF by clicking the link and apply to the email addresses found within. If you have other skills and think you would be a good addition to our team, head over to our careers page! Posted on December 8, 2014 at 14:00. We are thrilled to announce the immediate availability of our latest cloud pool, namely, the splitter cloud pool. Unlike other cloud pools, which act as easy to use abstractions over various cloud APIs, the splitter pool allows users to easily manage multiple cloud providers as if they are one. It does so by delegating both queries and update commands to the backend cloud pools it is configured to work with. Posted on December 8, 2014 at 10:40. To compare JodaTime DateTime objects for equality, we previously simply ran equals on them. This checks not only that two objects describe the same time (i.e. milliseconds since the epoch), but also that they have the same time zone descriptor (Chronology). For our purposes, and one might be tempted to think that this is often the general case, we only really wanted the first check, not the second. Amazon imposes a limit on how many filter values one may specify in the call to DescribeInstances, but does not specify how many. In practice, this has turned out to be 200, which we discovered when we (erroneously) tried to query for our instances and supplied the instance identifiers of interest as filter values. This is fine for deployments smaller than 200, but of course, runs into the FilterLimitExceeded error for larger deployments. While at it, support for deployments larger than 1000 was added, by handling Amazon’s implicit pagination/result set chunking with tokens returned from the DescribeInstances operation. The code for scale.cloudadapters, our open source Java-based cloud adapters, can either be cloned or forked directly on our GitHub page, or be made part of your own projects using your favorite Java dependency management tool, such as Maven, Ivy, or Gradle, by importing it from Maven Central.